Let me open with a transparent recognition: the past six months at General have been challenging for everyone. Our recent upheaval has been painful and revealing. General faces many challenges–financial, missional and cultural–and all of them have been highlighted over this past year. Many of you have responded so fervently, and for that I want to say “thank you.” Whether through comments on social media, or added financial gifts to get us through this tough time, or attendance at our many meetings and gatherings, you have cared for General with gusto. During this conflicted season I have realized just how many people really care about General. Really care. At times, I have thought that the entire Episcopal Church must have an opinion about us. So, thank you. Please accept my sincere gratitude for your concern about our individual and collective well-being. But of course, we move on. This is not the first time in 198 years that General Seminary has faced tumult, and General has always been able to move on and to come out stronger because of it. Rather than rely on snapshots of our challenging times over history, as our new Board Chair said during a recent sermon, we focus on our portrait. General’s portrait is rich and varied, serving the church for almost two centuries–and now we prepare for our next season of service with the same fervor as your concern for us. We get to update our portrait. Change is never easy. It’s really that simple. With General’s perennial three challenges of financial, missional, and cultural sustainability, a frequent question asked these days is, “What are you doing about the future at General right now?” I’d like to talk about that future. So now, General follows two parallel paths. The first path has been ongoing for the past five years. It continues now. 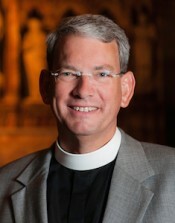 Despite the snapshot of conflict, the portrait of General’s fundamental goal of “educating and forming future leaders for a changing church in a changing world” remains unaltered. Our work to create financial, missional, and cultural sustainability in order to maintain relevance to the 21st century church is now more important than ever. The seminary-wide visioning process, begun five years ago and presented at the last General Convention in Indianapolis, is as fresh as ever. The new Way of Wisdom and Wisdom Year are in direct response to that five-year-old vision for General. This academic year we are in the midst of our Wisdom Year pilot program with two seniors as pastoral residents at Grace Church, Broadway, Manhattan and Christ Church, Short Hills, New Jersey. These pioneers of our innovative approach to theological education are integrating classroom learning with real-life experience while receiving hands-on mentoring and supervision. One bishop recently reflected that the Wisdom Year residency is like an old-fashioned curacy. Amen! Missional vitality in the 21st century depends on our ability to continue serving a “changing church in a changing world,” and General must respond. We are also proactively addressing our financial challenges. Last year, General suffered a $3.0 million cash deficit; this year, we anticipate it to be half that. Next year, we are working hard to cut it in half again. General’s long-term financial stability depends on achieving a balanced budget–or at least being within a horse-shoe throw of one. We can no longer rely on band-aid solutions and will continue to do the tough work to make General sustainable for another 198 years. Again, change is not easy. Our cultural sustainability means embracing the good, and reforming that which has gone astray over the past several years or several decades. Just like the old saw that “money follows ministry,” I suspect that it can also be said that healthy culture follows sustainability on all levels. It is not the cause of sustainability; it is the result. Again, change is never easy. Our second path is parallel to the first. We have real lives to heal. Reconciliation is one of those areas of our lives to which Christians are constantly called to be attentive. Restoring relationships at General–to the extent possible–takes on special meaning. Jesus commands it; the Book of Common Prayer reminds us this is our job; and the Mennonites are experts at it. We are embracing all three. Please keep us all in your prayers. Again, thank you for your support during this challenging time. I hope you join me in fully expecting our next 198 years to be the best time of our life together.